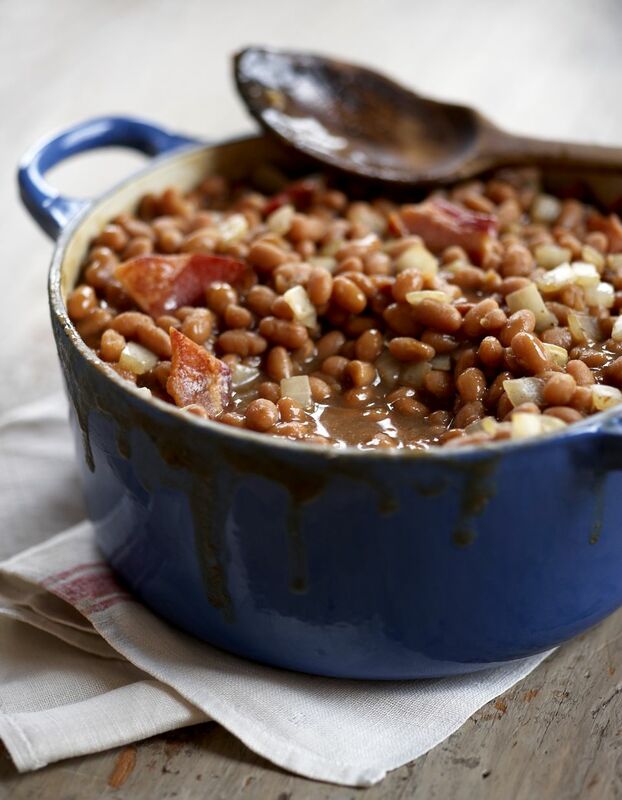 Baked beans are a classic comfort food dish that pairs well with a variety of meats - beef, pork, lamb, even chicken. We love this particular recipe because it includes two of our favorite ingredients: maple syrup and bacon. The recipe is fairly simple and the majority of the long cooking time is spent in the oven. The number one secret to awesome baked beans is long, slow cooking. Baking in the oven for 3 hours gives this dish it's deep, ​rich flavor. If you like your baked beans on the spicy side, throw in some finely diced jalapeños, chipotle peppers, or a little ground cayenne pepper. Drain the beans and place them in a large pot with enough fresh, cool water to cover 2-inches. Bring to a boil over medium-high heat; reduce heat and simmer for 2 hours, or until a bean is tender enough to mash easily. Keep an eye on the pot and make sure there is plenty of water, add more as needed. Preheat the oven to 325 F. Drain excess water from the beans and place them in an ovenproof casserole dish or dutch oven. Cook the bacon over medium-high heat in a heavy skillet until limp. Alternatively, you can cook the bacon in the oven on a cookie sheet lined with aluminum foil for 10 to 12 minutes. Using a slotted spoon transfer the bacon to paper towels to drain. Add the bacon to the beans. Discard all but 2 tablespoons of the rendered bacon fat in the pan. Add the onions and cook over medium-low heat until tender and slightly brown. (If you cooked the bacon in the oven, use a new saute pan with 2 tablespoons of bacon fat.) Add the onion to the beans. Cover the casserole loosely with foil and bake in the preheated oven 2 to 3 hours. If the beans seem too dry, add up to 1/2 cup water. The beans are done when the liquid is very thick. This recipe comes from the Culinary Institute of America and is served in their American Bounty Restaurant.